Stroke Essentials for Primary Care: A Practical Guide” is a must-have resource, offering the essential, practical knowledge required to evaluate and treat stroke patients. 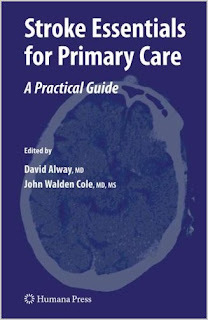 While an indispensable guide for primary care clinicians, including family practitioners and medical internists who often assume the care of stroke patients without the aid of a neurologist (primarily in underserved areas), the information contained herein is also an invaluable resource to all physicians in training, especially residents and fellows in neurology, cardiology, and surgery, among others.”Stroke Essentials for Primary Care: A Practical Guide” provides the latest diagnostic and treatment information that allows for greater clinical confidence. Designed to allow easy access to essential information, most chapters include a quick summary of their content and conclusions. Chapters review information on such topics as distinguishing features of presentation, rapid determination of stroke type, prevention strategies, long-term complications, and special topics that may apply to specific populations. Targeted and easy to read, “Stroke Essentials for Primary Care: A Practical Guide” is an essential resource for all practitioners in primary care medicine and specialty physicians in training.